How do Cornwalls compare to RF-7? I've been sharing a pair of first gen RF-7's between a HT setup and a 2 channel stereo to play my vinyl. I'm tired of changing the speaker wires on the back of the speakers to flip between movies and music. I have an all RF series 7.1 system and I'm not interested in breaking up the set. Would really like to try a set of Cornwalls for my 2 channel music and am wondering how you folks think they would compare with the RF-7's. The 2ch system I'm using is a McIntosh 2505 amp with a McIntosh C26 preamp. It's all solid state....50wpc. I've had Klipshorns in the past and nothing beats their detail in strings, vocals and horns but I prefer the direct firing woofers over the folded horn design for bass. To me, the RF-7's don't have the detail that the khorns have but they certainly have that forward firing thump on the chest. Wondering if the Cornwalls could be the best of both worlds?? the only way for you to know for yourself is to pick up a set of CW and listen. I would also recommend that you audition a set of Chorus ll as they essentially replaced the CW and the CW was dropped from the line up for about ten years. The Chorus ll has a better woofer and a much better mid horn in my estimation. But at the very least worthy of your time to listen and a nicer physical size when compared to a CW. I am sure that there are many CW fans who will disagree with my comments but only your appraisal matters in this situation. Find some of the CW and Chorus ll and give them a listen and see what you think. Bob Crites also has a very nice Cornscalla D type which is a two way design with a very nice horn that you might find bridges the gap between the two speakers you are considering and the horn is larger than either you are looking at which with horns is always a bonus. Best regards Moray James. I may get flamed for this but a pair of Heresys or Heresy II's with a fast and punchy, highly musical sealed subwoofer can give a pair of Cornwalls a run for their money, IMO. Just another thought. Wondering if the Cornwalls could be the best of both worlds?? Yes, the Cornwalls can be the best of both worlds, as well as a few other Klipsch offerings. ...Would really like to try a set of Cornwalls for my 2 channel music and am wondering how you folks think they would compare with the RF-7's...I've had Klipshorns in the past and nothing beats their detail in strings, vocals and horns but I prefer the direct firing woofers over the folded horn design for bass. To me, the RF-7's don't have the detail that the khorns have but they certainly have that forward firing thump on the chest. Wondering if the Cornwalls could be the best of both worlds?? Clearly the RF-7 (and the -II) are more of a compromise for size/shape than the CW. The CW is BIG--which from Hoffman's Iron Law means that it is going to sound better than the size-compromised RF-7 (and -II). Cornwall and Chorus is quite the upgrade over RF-7. And with Crites upgrades, even finer. Chorus and Cornwalls do music and movies with aplomb and equally fine. And make you grin! Geaux For It! I recently heard a pair of Cornwall and naturally compared them to my RF 7's. The Cornwall have a lot of bass but, the RF 7's sound a little more refine or less live. Some of this was setup related so, it is really hard to say which you will like more. Time for a test drive Wibucd. I would be happy with either in a 2 ch system paired with the right gear. OP, you can get a cheap switch box to change speakers or amps without having to change speaker wire connections. Get your self a set of Chorus 1 or 2, you'll be very happy you did! I seriously doubt you're going to get most heritage owners to pick the 7s. I also doubt you'll get most 7 owners to pick a big square box from another era. So.....that said they both sound great and its just a personal preference of subtle sonics and subjective looks. Also note I say most. To answer the? 7s with a sub give most any Klipsch stiff competition. To answer the? 7s with a sub give most any Klipsch stiff competition. At this point you are going to always wonder tell you get a pair lol. I have owned rf7ii and cornwalls. The cornwalls have super natural bass. They are really powerful speakers! And the horns are really smooth and clean. Its a great stand alone speaker thats really hard to find any flaws in. The rf7ii have a little better top end and sparkle. But they use a different horn driver than the rf7 so my comparison might not be that useful. The 7s also have a more modern look but the cornwalls will grow on you fast and look great in a room. Hey wilcud some more thoughts for you to kick around. I have owned Cornwalls and I did like them. Now I two might take some crap for this.....but when it comes to 2 channel I will pick the Chorus line, I have both 1s and 2s. As we all know most of our speakers will be "kicking" with just a few watt...... you put put 75-100 watts into a Cornwall....oh my......but let me say this, you start puttin the power into a ChorusII not to much will come close. When I say power, I'm talking well over 300 watts. Now I don't listen to my Chorus with 300+ watts pumping in them all day long...... but right around that 250 watts is where you hit that unreal chest pounding concert level sound. That's what I like...again not all day...but that is the chitt. Now with all that said......your amp.....McIntosh @ 50 watts per channel will sure drive any set of Klipsch. But I don't think it will bring those Chorus to full potential. Rather than using a big bad mono block with more power than you really need you can give the speaker more of what it needs to sound better if you vertically bi amp with a pair of good stereo blocks. Solid top quality stereo blocks of about 100 - 150 watts per channel is all you really need. The woofer on channel A and the mid and hi on channel B of the same stereo block ditto for the other speaker. Bingo. You will have more quality sound than you know what to do with. Hope this is of interest. Best regards Moray James. I appreciate all of the replies. I have considered the Chorus ll's before. I just liked the look of the Cornwalls. As with most purchases of older equipment the decision will likely come down to which of the two first pops up for sale within a reasonable drive. When I purchased my new crossovers from Bob Crites I had him set them up for bi-amping and I added an extra set of binding posts to my terminal cups. As far as sound quality goes I really cannot hear a difference but it does add options for powering them as Moray has suggested. 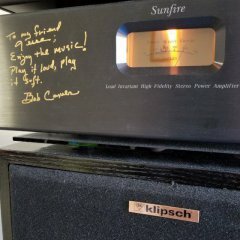 A regular Sunfire Cinema Grand (non signature) at 200 watts per channel will not fully drive the Chorus II (about 80% of max) but if you run 4 of the channels bi-amped it drives them with ease.